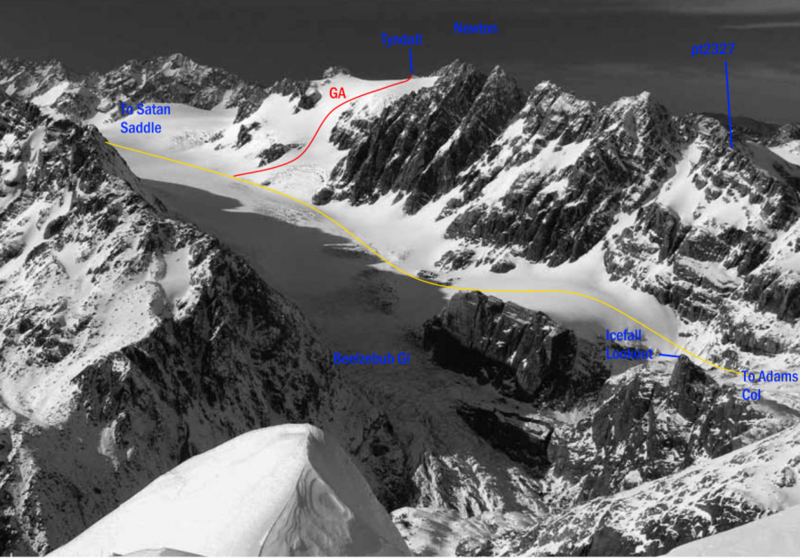 From about I35 252639, choose a route southeast up moderate snowslopes leading to the Main Divide a few hundred metres northeast of Mt Tyndall. Alternatively a longer, but easier, route approaches this same point from the Allah neve under Snowy Pk. Then cross easy snowslopes to a col west of Mt Tyndall. On southern slopes cross boulder scree then scramble up loose rock to the equally loose summit ridge, or alternatively follow moderate snowslopes part of the way slightly further east. A diagonal snow climb from the Garden of Eden up crevassed snowslopes that vary considerably and are often cut off later in the season. There are some big slots up here. Reach the ridge between Newton and Tyndall from which both peaks are accessible.